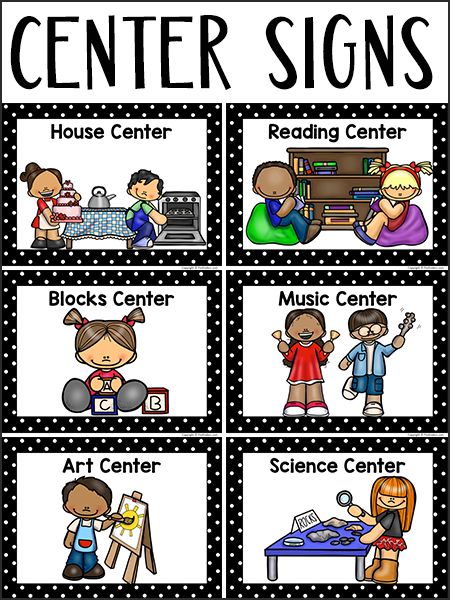 Here are some printable center signs for your Pre-K or Preschool classroom. I have a free set of signs available, but the set of center signs in my shop are really the best by far. This set of Center Signs has a bold black polka dot border and includes a printable PDF file as well as an editable PowerPoint file. If you want to change the titles of the centers on these posters just click the text and change it to your own words! There are 21 Center Signs included: Blocks Center, Art Center, House Center, Dramatic Play, Sensory Table, Science Center, Literacy Center, Writing Center, Math Center, Music Center, Reading Center, Listening Center, Fine Motor Center (alternate: Puzzles), Tech Center (2 signs: shows computer & tablet, other shows smart board), Pocket Chart Center, Games Center, Manipulatives Center, Play Dough Center, Snack Center, Calming Corner, Train Table. These are the free printable center signs I made back in 2010. 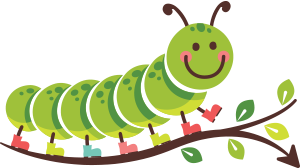 I don’t feel the clipart is up to today’s standards, but I’m leaving them here in case anyone would rather have the free set than the set in my shop. Click the button to download. Love your new Center Signs!!!! Thank-you! Thanks for the signs! Mine had gotten messy and I was going to replace them, so you read my mind. Do you have one for Dollhouse, Play Dough or Trains, by any chance? Thank you! I’m sorry, I don’t have the signs you mentioned. I have dollhouse & trains in the Block Center, and our Play Dough is in the Art Center. The Center Signs are great! I laminated them today and I am going to definitely use them for my classroom centers. All your signs are great, thank you! Love your site and I did us some for our preschool classroom! I just love this site. There is so much information.Thanks! Do you have these signs available in Spanish by chance? thanks for the signs. i revamped my whole classroom this year and needed a new music center sign. so i “took” one. you made a small part of my day easier. I love the 2 different sizes for center sign and ce3nter choice cards. As second year teacher in a different age group than last year I can anything. However, your website has provided me with more information and ideas than all the other sites! hello! love your signs. I was just wondering what program do you use to create them? I teach dual language – spanish and need to add the spanish words to them. Martha, I just used MS Word. You’re the 3rd person to request them in Spanish. I’d be glad to make them in Spanish & post them on the site, if someone can tell me the words. Thank you for sharing- These are nice to have. They are awesome! Thank you!! thanks for much for sharing everything on your site! i have printed & laminated your signed & have them in my room! i love them. but i wanted to make some new ones that match (my ocd kicking in!). i can only make a square border in word. is there any way you can post one in word format or something that can be edited? I just want to say thank you so much for sharing all these good and awesome things! on your web site that give aide to teachers in the classroom. Thanks!!! I love your center signs! I think it is always a great idea to have a visual for children to look at in the classroom so they can associate the picture with the word. I hope your students are enjoying these graphics! first ofall i love your website. you have inspired me to really think outside the box when it comes to lesson in PreK. thank you. I was wondering if you have a pdf file of pictures for a schedule? I’m sorry, Letty, I don’t have pictures for a schedule. My personal preference for picture schedules is to take pictures of your own class throughout their day. That way, the kids see a schedule that really relates to them. these are great! need a quiet corner sign and one that says table games. love them! These are AMAZING signs! SO much more colorful and appropriate than others I have found. Would it be possible to get a play dough sign and a listening center sign? Thanks, Shannon! When I get some time, I’ll try to make those. The reason I didn’t make those signs is because I have the play dough as part of my art center and listening as part of the reading center. But, I will try to get those done. thank you for sharing! Love the English/Spanish signs, perfect for our bilingual preschool. Karen, just starting up a kindergarten class and greatly appreciate the signs! Just wondering if you could tell me how I could make a sign for a water table, light table and puppet theatre? Thanks! Hi Jenna, If I can find images for those I can add them. I should be able to find a puppet. But, isn’t a water table the same thing as a sensory table? I was wondering if you might have a center sign for Smart Board or Promethean Board, preferably the Smart Board for my class. Your center signs were exactly what I was looking for. Thank you! Sorry to bother you, but I tried logging in and downloading the polka dot labels, and for some reason it won’t let me… Could the chalk board used in the Math Center sign be used for a smart board? Also, is there a way I could change that myself on my copy of the download? Thank you so much! Great signs thanks for saving me a step today and even cuter then I would have made BONUS! Glad you like them, Luann! Hi! Thank you so much for the great signs! I love them and can’t wait to use them! I bought the signs from TPT and when I went to print them, they all printed perfectly except for the social studies and sensory table signs. These signs printed with large black lines over some of the letters and I am not sure why. I tried multiple times and the same thing kept happening. Do you have any advice? Thanks again for sharing your signs! Thanks for the amazing classroom signs. I am using the small blue border signs around my room, but was wondering if you could send them to me in a file so that I could make them even smaller. I would like to make necklaces for each center with the same pictures on them so that I can limit the number of children in every center. Also, thanks for the amazing pictures of your classroom. I am inspired by them! Thanks for the Center Signs. They will work out great!!!! I just love your center signs! at first I made some own my own but yours a better! Thank You for helping teachers by doing all the you do. Wonderful…I am a bilingual pk teacher…..thrilled to see center signs in Spanish…many many thanks!!! Would you be able to send me the english spanish signs of a train table center and fine motor skills center. I would be happy to pay for them to have them match the other english spanish center signs. Thanks. 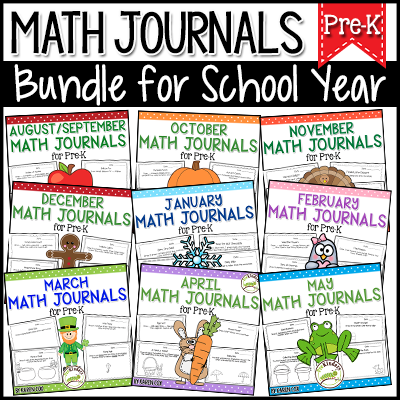 I am a prek bilingual teacher, it is very hard to find anything in Spanish. Thanks and let me know if you are planning on having anything else in Spanish. Thank you for taking the time to post/share all the wonderful information. I am starting a preschool/after school program that focuses on intergenerational involvement (combining the young with the elderly). I would love ideas or useful tools if you have them. Love these center signs cant wait to place in my classroom. Than k you so very much. Could you please check out the translation, and have them in polka dot border too please? PS : I would be happy to help to help with the translations, and I would love to help you to make some in French too, or trilingual one in English, Spanish, and French. Hi Lilith, Thank you for visiting. I am not the translator, those were translated by a visitor to this site who wanted the signs in Spanish. I realize that there are sometimes differences in opinion on how things should be translated. hi karen thanks for your reply. Here it is not a difference in translation, here the translation is wrong, and sounds ridiculous in spanish. I am a trained translator, fluent in spanish, and my husband is Mexican, and we both agree that the translation is so wrong it is comical. This kind of translation is typically what you get from a translation software. They need to be changed or removed. You maybe can ask some spanish parents about their opinion or help. Otherwise i d be happy to help you in a month or two. I am working on opening a bilingual dayhome too, so i will be working on my labelling. If you d like i ll post my translation here, and maybe we can ask some native speaker for their opinion. Thanks. I ll post my french labels too, but right now i am super busy moving, and getting the material for my dayhome. Thanks a lot. Honestly, I’m puzzled why you would tell me the translations are comical, yet not tell me the correct translations. Hello, I love your center signs. Is there any way to make it available in Spanish or editable? I struggle so to find good resources in Spanish. Thank you! These are GREAT!! Just wondering if you can make a kitchen center sign. Printed a bunch of others off for my son’s preschool class. Thanks! I bought the new version of the signs recently. Do they come in spanish? I’d be happy to purchase. Thanks. Thank you so much for making signs in Spanish. It is so difficult to find bilingual or Spanish preschool resources. If you would like some help translating any of your other materials, please let me know. I would be happy to collaborate with you. Thank you for the centers signs! Exactly what I was looking for tonight. Thank you so much! These signs work for my ESOL, and ESE Pre-K students. Your website is a fabulous resource! I love your signs. It’s so nice of you to share. 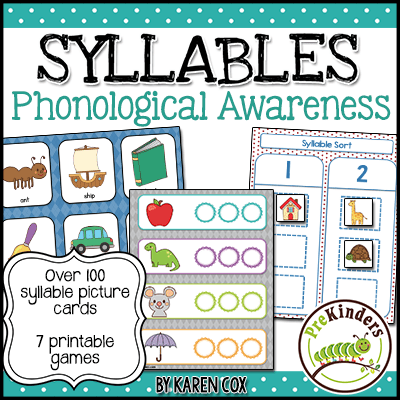 I cant wait to use them for my pre-K class. Thank you so so much for sharing these awesome center signs!!! I have been searching online for awhile now. I was going to go buy some at a teacher store, but then I found these. You helped save me money. I can’t wait to display them in my classroom. They are just what I needed! I love the polka dot border by the way, very eye appealing! I absolutely love your center signs. However, they would not be appropriate for my students. Is there any chance you might include more kids with brown skin tones in the mix? I wish I was savvy enough to figure out how to do it myself! I’m aware of it, but the artist who made the clipart did not make many with brown skin tones. I do mental health consulting in a large Head Start program. A bunch of the teachers I provide consulting to use your signs. I would like to be able to shrink them down to put in a choice chart for those kids that need an extra visual for making choices during centers time. How might I go about making these smaller. It will only print one tiny poster on a page. Is it possible to get them all on one page or at least multiples of the same poster on a page so I can save a tree? I love your website.It is the best site for teacher’s .I have the polka dot classroom rules pictures on our wall and i made a notebook with the pictures.When we are having circle time we read the rules everyday.